[Video] ‘Ways to be Wicked’ Official Music Video. Descendants 2, Dove Cameron • By Mylene • Comments Off on [Video] ‘Ways to be Wicked’ Official Music Video. [Gallery] New Stills of ‘Descendants 2’. 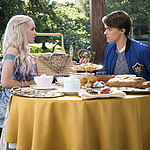 Descendants 2, Gallery Updates, Movies • By Mylene • Comments Off on [Gallery] New Stills of ‘Descendants 2’. [Video] ‘Descendants 2’ Official Trailer. Descendants 2, Dove Cameron, Movies, Videos • By Mylene • Comments Off on [Video] ‘Descendants 2’ Official Trailer. [Gallery] 2017 Radio Disney Music Awards. Dove Cameron, Events, Gallery Updates • By Mylene • Comments Off on [Gallery] 2017 Radio Disney Music Awards. 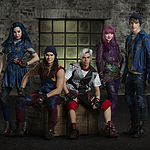 New promotional pictures of ‘Descendants 2’. Descendants 2, Dove Cameron, Movies • By Mylene • Comments Off on New promotional pictures of ‘Descendants 2’. Beyond that let’s remember Dove will make an appearance at Radio Disney Music Awards alongside her co-stars presenting the official ‘Ways to be Wicked’ music video. [Videos] Dove Cameron at Marie Claire’s 2017 ‘Fresh Faces’ Celebration. Dove Cameron, Videos • By Mylene • Comments Off on [Videos] Dove Cameron at Marie Claire’s 2017 ‘Fresh Faces’ Celebration. [Gallery] Dove Cameron at the Marie Claire’s 2017 ‘Fresh Faces’ Celebration. Dove Cameron, Events, Gallery Updates • By Mylene • Comments Off on [Gallery] Dove Cameron at the Marie Claire’s 2017 ‘Fresh Faces’ Celebration. New Photoshoot for Mane Addicts. Dove Cameron, Gallery Updates • By Mylene • Comments Off on New Photoshoot for Mane Addicts. From demure Disney darling to trendsetting fashion “It” girl–Dove Cameron has been making major waves with her Insta-glam girl style. 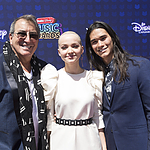 Best known on the small screen for playing her dual role in Disney’s hit show Liv and Maddie, we’ve watched Dove transform into a full on triple threat, adding both music and movies to her growing resume. Throw in her signature rag doll face–just look at those doe eyes and pouty lips!–and you’ve got yourself a superstar. And clearly, the world agrees– she’s got 11.1 million Instagram followers, NBD. We’ve been swooning over Dove’s modern day pin-up style for awhile, so who else better to tap for our prom Mane Muse? Below, celebrity stylist Chad Wood created four gorgeous prom hairstyles on Dove that are sure to take you into mega mane overload! Plus, Dove gets candid on her own prom, personal style, and her biggest hair mishap as a teenager–take a look! Give your prom look a jolt of rock and roll cool with textured, side swept waves with some killer hair accessories. Chad calls this ‘the bend’–a style he learned while studying at he Paul Mitchell school. The key to recreating the look is in the inconsistency. “You don’t want it to be too perfect,” Chad notes. MA: How would you describe your hair personality? Dove: My hair personality differs from “I slept on my lawn last night” to “coconut oil as hair gel” when I do it myself, all the way to “what the sun looks like in hair form” when I have my magical hair wizards to make it beautiful for me. I ain’t mad. Try a Madonna-inspired, high pony pop for prom! Perfect for adding mega style (and height) to your party look. The high pony pop is all about adding drama, so reach for weffs and extensions to get your longest, tallest hair ever. MA: What was your first prom like? Dove: I only went to one prom, actually! But I went with all of my friends, I wore a red strapless satin dress (classic) and I actually had platinum hair! Side part, but, hey. Gotta give 16 year old me some credit. [Video] The Tonight Show: Virtual Reality Pictionary. Dove Cameron • By Mylene • Comments Off on [Video] The Tonight Show: Virtual Reality Pictionary.